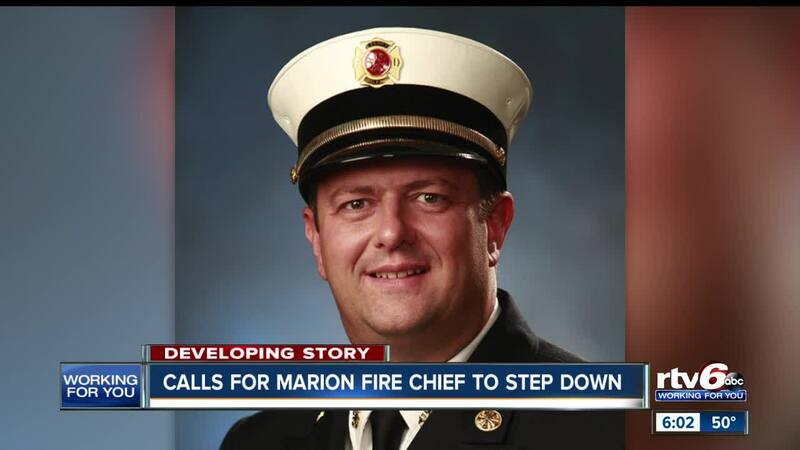 Calls for Marion Fire Chief to step down. MARION —Firefighters at the Marion Fire Department said they are stunned about comments the fire chief reportedly made to a firefighter who confided in him about Post Traumatic Stress Disorder (PTSD) symptoms he was having. They are now asking the city's mayor to demote the fire chief, or for him to step down. "It's probably the least common thing for someone to talk about it, to be honest with you," Captain Jordan Lamb, Marion Fire Department, and local union president, said. Captain Lamb has been a part of the Marion Fire Department for 12 years. Day after day, he responds to difficult calls. He said every firefighter and EMT handles the emotions differently. "I just try to keep it in and let it pass. Kids are the worse - especially since I have kids," Captain Lamb said. "I can see anything, but you put a kid out there it's going to affect me." The department recently went through mandatory suicide awareness training. One firefighter came forward to the chief expressing his feelings of PTSD. It was the chief's response that has firefighters upset. "He said, 'ha, we'll tell your family how good of a guy you were,'" Captain Lamb recalled. He said the chief then made a joke, referencing the death of another firefighter. "I don't think the chief meant it, I think he was just trying to lighten the mood," Captain Lamb said. "That is not your job. Your job is to hear the cry and get this guy help." RTV6 spoke with Chief Geoff Williams, who has received disciplinary action from the city. Chief Williams was very limited on what he could say due to his position. "This is a personnel matter. As an administrator I am required by HIPPA the protection and confidential handling of protected health information. I cannot comment on any comments taken out of context during a mental or physical health related conversation." Captain lamb said he doesn't plan to stop fighting until Chief Williams steps down. "He is supposed to be the cheerleader for this fire department and above all have your back when you need help. He has failed. It was the ultimate betrayal." Since the incident, Captain lamb took reports from other firefighter who were present when the comments were made. He said the city has put that firefighter on administrative leave, and are getting him the help he needs.